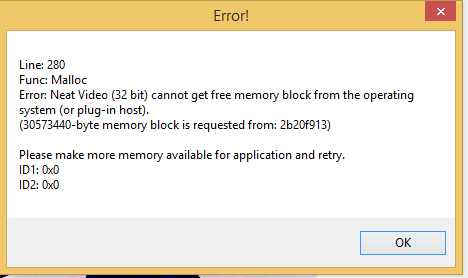 I have a big problem with NeatVideo 4 32bit ( 4.8.5 and all other version ) in virtualdub2 . I tried to format my personal computer but the error doesn't disappear. P.S.In virtualdub2 64bit and neatvideo4 64 bit no problem ,neat works correctly ! 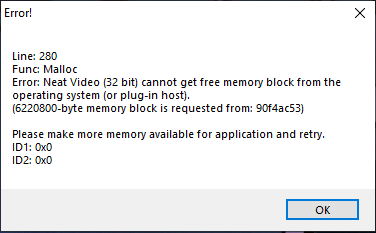 Yes, 32-bit software is more limited in terms of available memory, so there is a much higher chance of running into a situation of memory shortage, which seems to be what is happening on your computer. I recommend to use the 64-bit version in such situations (or always).